On itch.io you can create your own message board for games and game jams. Our message boards come packed with a lot of features for keeping discussion going and moderating your community. Subcategories have a few new options: you can archive subcategories that should be read only, and hide subcategories that don’t need to be viewed anymore. Moderators will have elevated permissions for any categories at or below where they’ve been enlisted. This means you can have someone be a moderator for only a specific section of your community. Each subcategory can have its own set of rules, voting options, posting permission, and membership as well. Topic tags let community hosts to provide a set of tags that can appear next to a topic’s name on the post list. A great way to keep things organized when collecting bugs or planning new features. The topic creator, or any moderator, can choose a tag when creating or updating a topic. You can pick the list of tags from the community’s edit page. Topic tags only apply to the current category, so you can have different sets of tags depending on the category when using nested categories as described above. 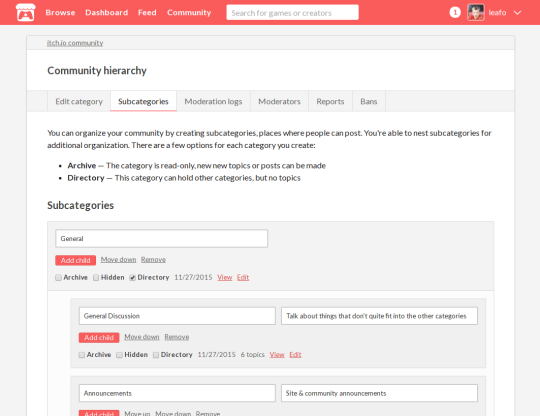 The design of category and topic lists have been redone to be more space efficient and easier to read. Additionally, we’ve updated category lists, topic lists, and the topics themselves to be mobile web friendly. If you’re on your phone you don’t need to worry about pinching and zooming to read anymore. If you have any comments you can leave them on the announcement post.